Kiawah River Estates, it seems, is on everyone's mind. When asked if she would answer some questions about the upscale neighborhood on Johns Island, Rebecca Lind, a real estate agent for AgentOwned Realty, a short drive up the road in Summerville, South Carolina, replied: "Oh, you-re writing about it, too." Whether you-re seeking a place to retire, shave a few strokes off your golf game, or invest for your future, Kiawah River Estates is a perfect fit. There-s good reason people are thinking and talking about Kiawah River Estates. One glance at the gated community will quickly explain why it has become one of the area-s most highly sought after addresses. Building got underway in the early 1990s on this exclusive and reclusive subdivision, and until recently the neighborhood was known as Hope Plantation, a nod to the area-s history as a thriving cotton and indigo plantation centuries ago. Just last year, homeowners decided to rename the community after the nearby Kiawah River. Situated at the end of Johns Island, not far from Kiawah and Seabrook islands, Kiawah River Estates is secluded and tranquil, yet just a 30-minute ride from downtown Charleston. "It-s the perfect location," Lind says. "You have the privacy and luxury of the island yet you-re just a short drive from downtown." World-renowned Kiawah Island, just a mile away, is draped in lavish magnifi cence, and adjacent Kiawah River Estates is no different. For starters, the neighborhood is situated on Oak Point, one of America-s best golf courses, according to Golfweek magazine. Although Oak Point is a public course, residents of Kiawah River Estates enjoy its pristine landscaping and many other amenities that make the neighborhood unique. For example, only those who live in Kiawah River Estates have access to the community-s beautiful swimming pool and tennis courts. But Kiawah River Estates isn-t just for people looking to strengthen their breaststroke or perfect their backswing, it-s also a nature lover-s paradise. Steeped in a beautiful semitropical environment, Johns Island has been home to alligators, eagles, egrets and many other species of wildlife for thousands of years. Residents can sit on their front porch while eating breakfast and watch a flock of stunning white egrets seamlessly soar across the morning sky. Athletics and aesthetic scenery aren-t the only reasons people are flocking to Kiawah River Estates. Some are looking for a peaceful place to enjoy a well-earned retirement or fi nd the perfect vacation home. Others, however, are simply interested in cashing in on the area-s increasing popularity. "The area is absolutely booming," Rebecca explains. "So many people now are into purchasing and reselling simply to make a profi t, and this place is perfect. There-s equity already built in." The numbers justify her optimism. Within the past few years, the price of the average house at Kiawah River Estates has steadily increased, with today-s average home ranging from $550,000 to $650,000. The community also can boast of some of the island-s most exquisite houses, with price tags starting well above $1 million. Those looking for investment properties, however, will have to hurry because the 365 lots in the subdivision are going quickly. Approximately 90 homes have been built already. "The amount they-re building is going absolutely crazy," Sharon Stefano, property manager of Kiawah River Estates and a real estate agent for Prestige Property Consultants, says. "The area is really in high demand and the neighborhood is getting bigger and bigger." Priced from $199,000 to $299,000, it won-t be long before these lots are gobbled up by people hungry to call Kiawah River Estates home. In addition to its ideal location, the popularity of Kiawah River Estates is driven by its diverse atmosphere. Unlike many new subdivisions, this one fortunately has its own sense of style. "It-s not a cookie-cutter community," Stefano explains. "Each home is built with a unique Lowcountry design, allowing home builders to be expressive and creative, while maintaining visually unifying impressions of community and style." 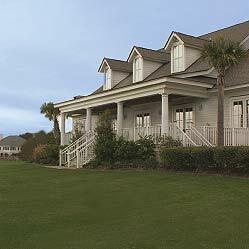 John-s Town, a subdivision embedded within Kiawah River Estates, is the only part of the community with a design plan. Each of these homes includes a detached garage and a long, narrow front porch, and they are painted in bright pastel colors, giving each home a distinct Charleston flavor. "It really is a fantastic community," Sharon says. "It-s home to all types of people from all walks of life." Whether you are seeking a place to retire, shave a few strokes off your golf game or invest for your future, Kiawah River Estates is a perfect fit.